Makeover: From left, Netflix’s “Queer Eye” fashion expert Tan France, Mary Jones, Dr. Holli Careswell and grooming expert Jonathan Van Ness pose for a photo during an August 2018 filming of the reality TV show. It was also obvious that when Mary, aka “Shorty,” laughed or smiled, her hand almost instinctively went to her face. “I noticed, the first day, you kept covering your mouth when you laughed and smiled,” said Tan France, a fashion expert on the Emmy-award winning reality series which involves a team performing a makeover on matters of fashion, style, personal grooming, interior design and culture. Mary is missing a front tooth that resulted from a childhood bicycle injury. 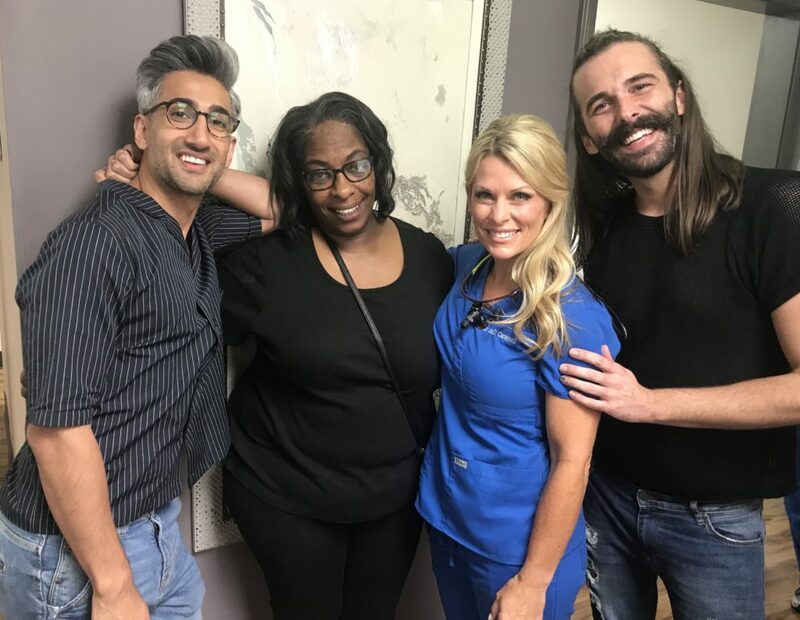 “Queer Eye” is known for its ability to bring viewers both laughter and tears, and this particular episode reached its emotional peak inside a place familiar to ADA members: the dental office, thanks to the work of Dr. Holli Careswell and her team. After replacing Mary’s missing tooth and getting rid of a gold tooth, Dr. Careswell held up a mirror to Mary. As soon as those words came out, emotions burst and the tears began to flow. “I can smile again,” Mary said. That scene was not only an emotional moment for Dr. Careswell and her patient. To her, it was also a good moment for dentistry. Dr. Careswell said the show first reached out to her in July 2018 through the Kansas City Film Office. They filmed the episode a few weeks later. It was her first dental segment on a television show. Before filming, Dr. Careswell said she had a chance to sit down with Mary to create a treatment plan. Mary is now a regular patient of Dr. Careswell’s. The response from Dr. Careswell’s family, friends, patients and dental community has been very positive. Along with a new smile, Mary and her sister received help with their business in the episode. The Fab Five helped them get their barbecue sauce bottled for retail, and interior designer Bobby Berk turned their barbecue stand from a no-frills shack into a stunning and functional restaurant. Dr. Careswell said she has yet to visit Jones B-B-Q but she hopes to go soon. The Jones sisters have sent her and her staff bottles of their barbecue sauce. Dr. Careswell said she hopes the show releases some clips that didn’t air on the episode.